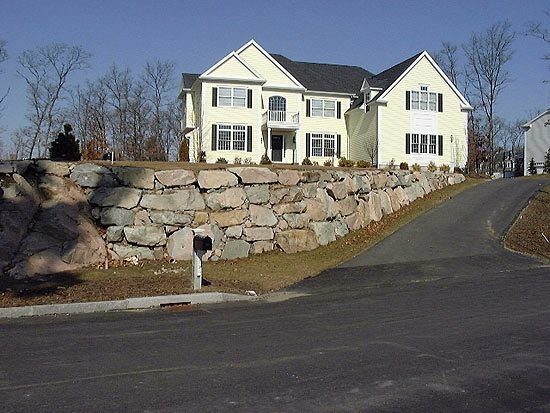 No matter the layout, a driveway on a hillside needs drainage to decrease soil erosion. A. Cardillo and Sons in Waltham, MA. 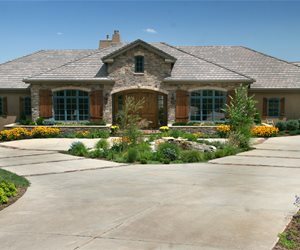 There are a variety of layout options for residential driveways. For example, you can have a circular drive, a long straight drive, or a driveway with sweeping curves. As with any home improvement project, you'll want to consider function before form. With that in mind there are four main considerations when determining the best driveway layout. Do you want room for two cars to pass? Do you need space for a turn-around? How much parking would you like? Does your garage face the street? Is it on the side of your home? Or is it a detached garage in the rear of your house? 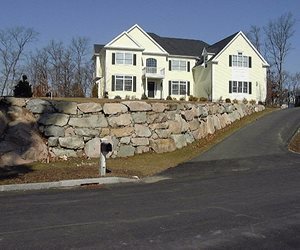 Will your driveway need to traverse a steep slope? Are there mature trees or large boulders you want to work around? Do you want a grand estate-like entrance? Or are you looking for a simple driveway that doesn't distract from your home and landscaping? Circular drives are one of the most popular driveway layouts. Sometimes called a horseshoe driveway, this layout option has an entrance at the road, rounds off as it approaches the house and then has a separate exit lane leading back to the road. This type of driveway is so popular because it eliminates the need for backing out or turning around so that you can always safely enter oncoming traffic in drive with a clear view of the road. A common variation on the circular driveway is the teardrop driveway. A teardrop driveway has only one entry and exit point off the road, but opens into a loop that cars may drive around. Whether a standard half-circle, a horseshoe or a teardrop design, circular drives require quite a bit of room, so they aren't typically an option if you have a small front yard. 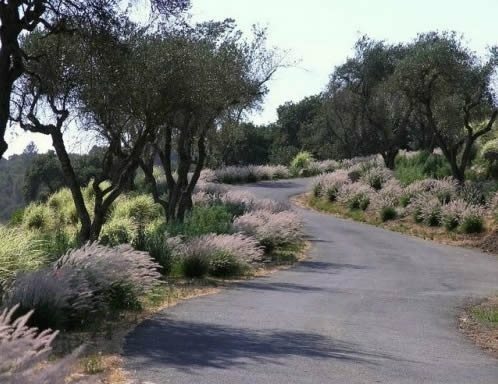 Gentle curves help this driveway blend in amongst the ornamental grasses and olive trees. 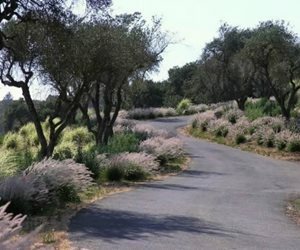 Michelle Derviss Landscape Design in Novato, CA. There are a variety of reasons to opt for a curved driveway. First is that the best access point from the street does not line up with your garage, requiring the driveway to curve or angle. 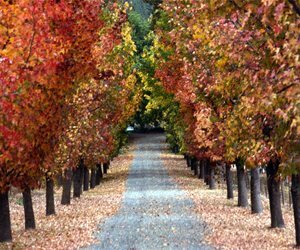 Second is that your property has existing trees, boulders or other features that you want your driveway to be designed around. Third is that you are looking to add interest to the overall look of your home and front yard. Whatever reason you have for wanting a curved driveway you'll want to make sure that it is maneuverable for all types of vehicles, from compact cars to large delivery trucks. Broad sweeping curves are the easiest to navigate and look the best. Additionally, you want to avoid placing curves too close to the street or house. This will give drivers time to safely straighten their wheels after leaving the road and before entering a garage or parking space. There are two situations in which a completely straight driveway is appropriate. First is if you have a small front yard and the distance a vehicle will need to travel from street to garage is very short. 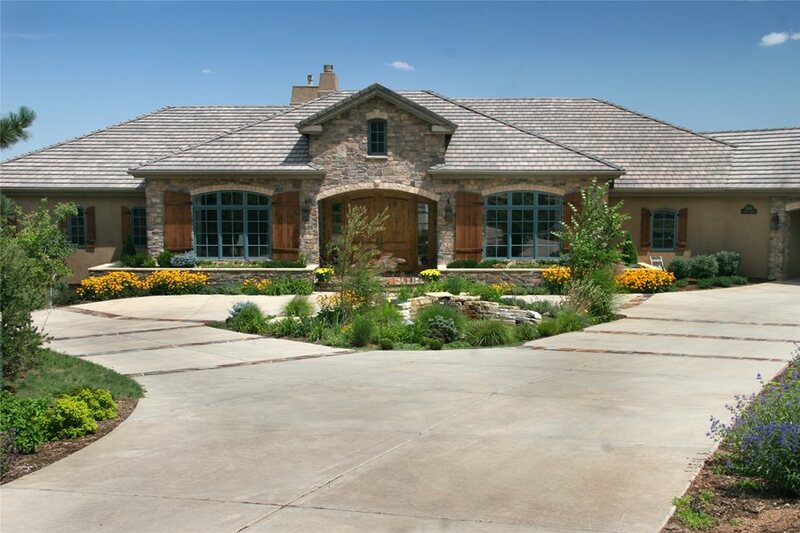 In this situation your layout options are limited and it is best to keep your driveway simple and functional. Interest can be added to a short, straight driveway with decorative paving materials such as stamped concrete or interlocking pavers, as well as creative driveway lighting and striking plants. Second is if you have a long distance between the street and your home and are looking for an estate-like entrance. 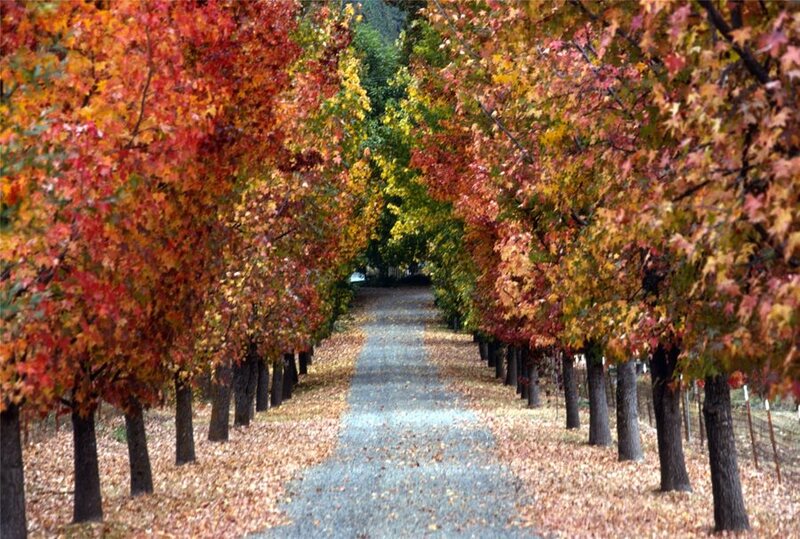 A long, straight driveway lined with trees is a great way to welcome guests to your home. This type of driveway layout purposefully directs people's focus to your home, putting it on display.